I read your article on www.legalrecruitment.blogspot.com and was wondering if you could give me some advise on the following matter. I achieved a 2:2 in Law 8 years ago, for about 6 months after my degree I went on to work in 2 law firms as a temporary office administrator. I learned a few things and was even more interested in pursuing a career in law, after the contract was finished and the fact that I couldn't get another job straight away I decided to go on and do other things and among this was opening my own limited company - facilities management company. The company is still in existence and have been in business for over 3 years now, but after learning that my degree will be stale after 7 years I then decided to go on and dothe LPC as I always knew I was going to continue and finish off to qualify as a solicitor at some stage in my life. My main concern is what are my chances of securing a Training Contract especially after being out of college for so long, and the situation with the current economy? Although running my own company as a Managing Director gave me a lot of experience, guts, courage, confidence to stand out, build client relationship, advertise, market and present company's services to big companies out there, I went door to door and joined business networking organizations searching for business and introduce my company, I have few people working for me, until recently, due to the situation with the economy... I have often used some of the legal knowledge I achieved in college to my business which was always a pleasure. The answer is fairly simple - it depends how much effort you are prepared to put in. 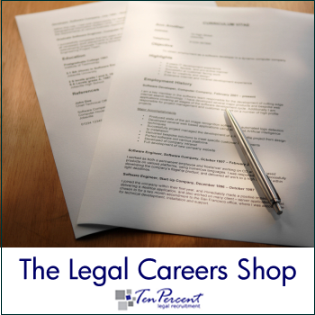 Very few people walk straight into a legal career, and all the work and effort you talk about in your last paragraph is directly relevant to you starting a legal career. It really is often the case that you will have to sell yourself to law firms - whether face to face or over the telephone, and be prepared to offer them something for nothing to gain experience. In my experience, those who persistently keep trying to get somewhere with their career eventually do, and those who make a half-hearted effort and then give up because it is too hard fall by the wayside. There is a free leaflet on the www.ten-percent.co.uk site giving help and guidance to students and graduates looking for legal work experience. Visit the careers centre for details. In March 2010 Ten Percent Legal Recruitment introduced Ten-Percent Unlimited, a revolutionary concept giving law firms the chance to recruit directly using our database resources with a one-off fee for a 12 month period. We will allow you to contact as many candidates as you want to through our database, whether by letter, e-mail or telephone, and to recruit without any further charge. 1. Recruitment is turned on its head. You are playing the part of the legal recruiter (ie us! ), and hence you need to be very nice indeed to candidates. 2. Most of our candidates are always interested in hearing about positions, and lawyers tend to be flattered if they think they are being headhunted. This is the best way of approaching them. 3. Keep all communication as short and vague as possible - candidates tend to be put off by specifics when in fact a position can suit them perfectly. Promote and market your firm and opportunity initially as if the candidate was a potential client. 4. Make sure you keep an eye on the candidate database - we tend to update and overhaul it every week, as well as add new candidates in cycles of 7 days. 5. Request an updated CV before interviewing. Quite a number of our candidates post a CV with us at some stage but do not update for some years. Although all of them are registered as candidates and receive regular job updates as well as newsletters, not all of them are actively seeking work at any time. Passive candidates are highly sought after in recruitment circles, as those who are actively seeking work tend to be those who are least suited to positions. 6. If you have very specific vacancies with a particular specialism, it is worth considering reverting to our conventional recruitment service, as although it costs more, you also get our expertise in sourcing the ideal candidates. 1. Put your name at the top of the page. (about 1% of all CVs omit this rather important information. 2. Include your date of birth if you feel it is an asset to you. 3. Include a profile underneath your personal and contact details. In this profile put your jobtitle (tailored to the post you are going for), the number of years experience you have, where you are looking for work, how much money you want and when you can start. Keep it very brief indeed. 4. Include your date of qualification if relevant and also date of admission. Dont forget the PSC if you are a solicitor. 5. For your work experience write as much as possible in bulletpointed format. This is by far the most important section on the CV. Facts and figures wherever possible. 6. Dont forget your job title in the work experience section. Again - tailor it where possible. 7. Put your computer skills on the CV. Case management systems always welcome. 8. Activities and interests - these get jobs and interviews. 9. Two references if you are not in work. 10. Use as many pages as you need to, and always send the CV by email unless specifically requested not to. Locuming requires you to almost certainly register as self-employed with the HMRC (a very easy procedure - see their website) and to be prepared for periods out of work (see above). It used to be very lucrative but not so much these days due to the market being so much tighter. You do not need to do anything in order to provide locum services, but it is probably worth making a decision whether you want to work through an umbrella company or go self-employed directly to firms. Some agencies offer employed locum work, but Ten-Percent does not deal on that basis. Do not turn any locum work down to start with if at all possible. We often get asked by firms who rarely use locums how exactly they go about using them, so below are our ten top tips for getting the most out of locums and effectively using them. 2. Do not think that a locum will work on the same wage levels as a permanent member of staff. They won't. As a rule of thumb, most locums work 7-9 months out of 12 and cannot afford to negotiate too far down on daily rates. It used to be a very lucrative line of work, but not anymore as work has got harder to come by. 3. Do not use a locum to clear up a mess unless you have specifically told them beforehand that this is the assignment. We know of locums who have walked straight out of assignments like this on the first day for fear of the mess affecting their practising certificates. 4. Specify holiday dates and do not try to get locums to come in beforehand unless you are going to pay them for their time. 5. Always ask the locum to bring with them their proof of ID, practising certificate and two references on the first day. 6. Do not specify requirements for a locum that are too specific. Try to focus on what the locum is needed for - you cannot expect a locum to generate business - they will simply cover a caseload. 7. If the locum is there to cover maternity leave, keep in touch with the member of staff on maternity so that you can keep the locum updated on an end date, otherwise you may find the locum accepting another booking when you still need them. 8. Sort out the payment method before accepting the locum. Ten-Percent Legal for example does not employ locums - we introduce them and charge our fee via invoice. Lots of locums are self employed and either issue invoices or use umbrella companies. 9. Be nice to the locum - you may want to employ them permanently. 10. Make sure you spell out your chain of command for the locum. A complaint we have heard in the past is that a locum has joined a firm, the senior partner has gone on holiday, but not told his staff who is in charge whilst he is not there.